The year-end annual Vibrant Parish Coordinators' meeting began Monday in Spain in the Madrid suburb of Los Molinos. The conference seminar is taking place at the "La Cerca" Casa de Oracion retreat centre about an hour's drive from Madrid's international airport. Coordinators from all the eparchies and exarchates of the Ukrainian Catholic Church from around the world have made their way to Spain this year for a week of presentations and discussions and strategizing. It is only the third year that all coordinators (instead of being divided into "region" - e.g. "North America") have come together to collaborate on a scale that would give everyone a clearer picture of the activity and different needs throughout the whole Church. Spain was chosen this year because, it is actually quite close for most coordinators that are located all over Europe, and relatively "central" for the coordinators of North and South America, Oceana and Asia. 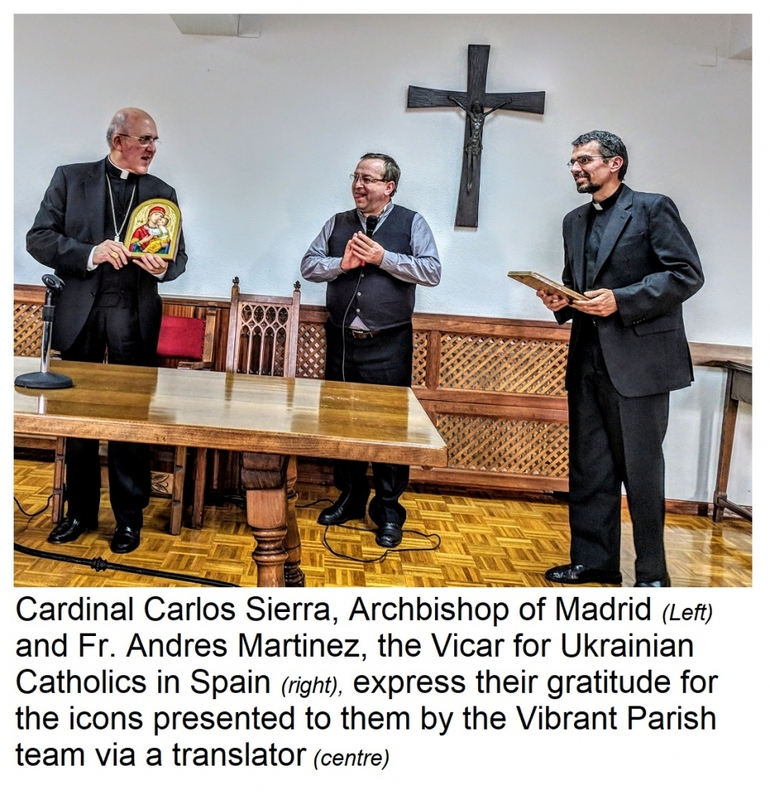 Another reason for choosing Madrid was to offer a bit of support to the Ukrainian Catholic in Spain, which rapidly growing and developing parishes all around the country. The first day saw initial registration and a lunch with the Archbishop of Madrid, His Eminence Carlos Cardinal Osora Sierra. Following the meal, there was a brief conference with Cardinal Sierra where he explained his relationship with the Ukrainian Catholic Church. In 2016 he was appointed as the "ordinary" (i.e. the local go-to bishop) for Ukrainian Catholics and all Eastern Catholics living in Spain. On the Madrid website, there is mention of the Comunidad Católica Ucraniana, situated at the newly built Church of Our Lady of Good Fortune, where Ukrainian Catholics, under the pastoral care of Fathers Ivan and Vladimiro, have a Divine Liturgy every Sunday afternoon at 3:00 pm. 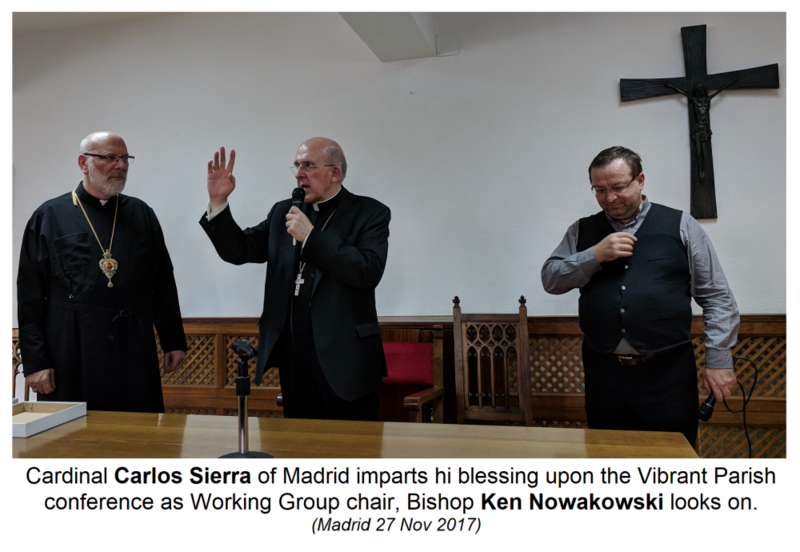 However, there are many other Ukrainian Catholic parish communities within the Archdiocese and throughout Spain so the Cardinal has also appointed a vicar - Fr. Andres Martinez Esteban - to assist the communities in organizing all their pastoral needs and, God willing, eventually developing into a single autonomous structure within that country. Not all delegates to the Vibrant Parish conference had arrived yet, but it was decided to take the requisite group photo while the Cardinal was visiting. Following the visit, the conference moved back into schedule. An Moleben' to the Holy Spirit was led by Bishop Bohdan Danylo of Parma, Ohio. After introductory welcoming remarks by the chair of the Bishops' Vibrant Parish Working Group, Bishop Ken Nowakowski of New Westminster, B.C., Bishop Bohdan gave a mini refresher course on the history and goals of the Vibrant Parish movement. It was appreciated by all, especially the number of new coordinators that had joined the group since last year. Working Group member, Fr. Andrew Onuferko of Ottawa, Ontario, then chaired a fascinating session on updates and reports from the various regions of the Church. The reports dealt with the progress in each region and individual eparchies with regard to realizing the Vibrant Parish mandate. Among the coordinators participating, there are five from Canada: Rev. Michael Kwiatkowski for the Archeparchy of Winnipeg; Rev. Dymytro Hancharyk for the Toronto Eparchy; Rev. Daniel Kuc for the Eparchy of Edmonton; Rev. Ivan Nahachewsky for the Eparchy of Saskatoon and Rev. Yurij Vyshnevskyy for the New Westminster Eparchy.